Ghatam - is a percussion instrument from the Carnatic music of South India. The ghatam has the same basic shape of an ordinary Indian clay pot but made specifically to be played as a musical instrument(Ghatam in Sanskrit means a pot). The ghatam usually accompanies another percussion known as Mridangam. Mridangam - is a percussion instrument from South India and it is the primary percussion of the Carnatic music. The name "mridangam" has derived from the two Sanskrit words "mrid" clay or earth and "ang" the body. Pakhawaj - is barrel-shaped, two-headed percussion instrument from Northern India. This percussion instrument goes back to the dhrupad style and widely used as for solo and an accompaniment including for various forms of music and dance performances. The pakhawaj has a low mellow tone but very rich in harmonics. Sitar – the Sitar is the most popular instrument of North Indian Classical Music. It can have up to four main strings, three or four drone strings and thirteen sympathetic, or resonating strings. There are few versions of Sitar are available today. Sitar is made of seasoned gourd and wood. Sarangi – is the most prominent bowed instrument in North Indian Classical Music, and traditional accompaniment for Vocal classical, tabla solo as well as solo Sarangi performances. About two feet in length, the instrument is made of wood covered with parchment, and has four gut strings on top and twenty-three sympathetic strings that help give the Sarangi its shimmering sound. Sarod – is a fretless lute with a fingerboard faced with metal and bottom part of the instrument is covered with the goat skin. It is plucked with a pick made out of coconut shell. Sarod has evolved from Afgani instrument known as Rabab. Santur - this instrument consists of a finely finished trapezium shaped box with metal strings run across the top. The strings are grouped in three strings per note, called courses, and sounded by striking with a pair of wooden mallets. Santur is very similar to the hammered dulcimer of Europe. Surbahar – is a bass Sitar. It is substantially a larger instrument than a Sitar, and is tuned anywhere from four steps to an octave lower than a Sitar. Surbahar has an advantage over Sitar in that it has a longer sustain and it’s ability to meend (glissando) up to an octave from a single fret. A Surbahar produces much heavier sound than a Sitar, therefore this instrument is used commonly for Alap, Jor and Jhala. 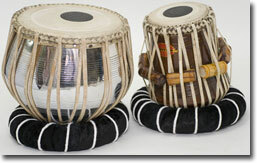 Tabla - (paired hand drums) is the primary instrument of North Indian classical and semiclassical music. Comprising of a "baya" (left hand - bass drum) and "tabla" (right hand - pitched treble drum), the instrument is capable of producing a varity of distinct, tonal and percussive sounds covering the gamut from low growling inflections to staccato torrential flurries to bell-liketones. The right hand drum is one of only two drums in the world (both north Indian) capable of producing an accurate pitch with no conflicting overtones. The pitch of the left hand drum is varied by using combination of pressure and moving stokes. Tanpura – Tanpura is a drone instrument. It looks similar to a Sitar without any frets. A Tanpura has four strings tuned to the tonic of the given Raga. A Tanpura is always used for the classical vocal recitals. Veena - is a plucked stringed instrument used mostly in Carnatic Indian classical music. There are few kinds of Veens. One who plays the veena is referred to as a vainika. -The Saraswati veena named after the Hindu goddess Saraswati. The Saraswati veena is used in the Carnatic music of South India. -The rudra veena also called bin, and named for the Hindu god Shiva used in Hindustani (north India)classical music.The rudra veena has a long wood neck with two large round gourds (resonators) are attached under the long neck. -The Vichitra Veena is the modern form of ancient Ektantri Veena. It is a fretless and has two large resonating gourds (tumba). The vichitra veena is a plucked string instrument used in Hindustani music.